"south of the Yellow River"
Henan (Chinese: 河南; pinyin: Hénán; Wade-Giles: Ho-nan), is a province of the People's Republic of China located in the central part of the country. Its one-character abbreviation is 豫 (pinyin: yù), named after Yuzhou (豫州 Yù Zhōu), a Han Dynasty province (zhou) that included parts of modern-day Henan. The name Henan literally means "south of the (Yellow) River" (Huang He). The province is contiguous with many other Chinese provinces, including Hebei to the north, Shandong to the northeast, Anhui to the southeast, Hubei to the south, Shaanxi to the west, and Shanxi to the northwest. With nearly 100 million people, Henan is the most populous province in China. It is often called Zhongyuan (中原 zhōngyuán) or Zhongzhou (中州 zhōngzhōu), which literally means "central plains" or "midland." This name is also broadly applied to the entire North China Plain. Along with being the most populous province in China currently, Henan is also important because it is traditionally regarded as the cradle of Chinese civilization. Northern Henan, along the Yellow River, was the core area of ancient China for at least the first half of Chinese history. The two cities of Luoyang and Kaifeng each served as the capital city for a long list of dynasties throughout this period. Archaeological sites reveal that prehistoric cultures such as the Yangshao Culture and Longshan Culture were active in what is now northern Henan. 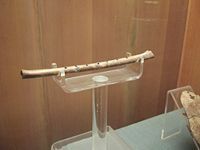 The Erlitou culture, which has been controversially identified with the Xia Dynasty, the first Chinese dynasty as described in Chinese records, was also centered in Henan. The first literate dynasty of China, the Shang Dynasty (sixteenth century B.C.E.-eleventh century B.C.E. ), was centered in Henan. Their last capital, Yin, was located at the modern city of Anyang in Henan. In the eleventh century B.C.E., the Zhou Dynasty arrived from the west and destroyed the Shang Dynasty. Their capital was located initially in Hao (near present day Xi'an in Shaanxi province). In 722 B.C.E., it was moved to Luoyang in Henan. This signaled the beginning of the Eastern Zhou Dynasty, which was a period characterized by warfare and rivalry. What currently constitutes modern-day Henan was divided into a variety of small states, including Hua (destroyed by Qin in 627 B.C.E. ), Chen, Cai, Cao, Zheng, Wei (衛), and Jin. Later on, these smaller states were replaced by the Han and Wei (魏). Throughout this period, the state of Chu also controlled much of what is now southern Henan. In 221 B.C.E., the state of Qin (from what is now Shaanxi) completed the unification of China, establishing the first unified Chinese state, the Qin Dynasty. Their rule was followed by the Han Dynasty in 206 B.C.E., who initially had their capital in Chang'an (now Xi'an, which is located in Shaanxi province). The second half of this dynasty, (the Eastern Han Dynasty) moved the capital to Luoyang. The late Eastern Han Dynasty saw war and rivalry between regional warlords. Henan was the power base of Cao Cao, who was based in Xuchang and eventually succeeded in unifying all of northern China under the Kingdom of Wei. Wei then placed its capital in Luoyang, and the Western Jin Dynasty that followed also had its capital located there. In the 4th century, nomadic peoples from the north invaded northern China. Henan then came under the rule of many successive regimes, including the Later Zhao, the Former Yan, the Former Qin, the Later Yan, and the Later Qin. The Northern Wei Dynasty, which unified North China in 439, moved its capital to Luoyang in 493. Northern Wei splintered in 534 and would not be restored until 589, when the Sui Dynasty reunified China. 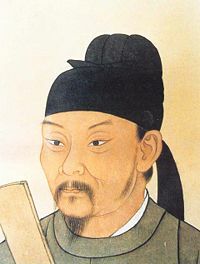 Sui Emperor Yang's costly attempt to relocate the capital from Chang'an to Luoyang contributed to the downfall of Sui. The Tang Dynasty that followed kept its capital in Chang'an and lasted for three centuries, but eventually succumbed to internal strife. In the Period of Five Dynasties and Ten Kingdoms that followed, Kaifeng was the capital of four dynasties: the Later Liang Dynasty, the Later Jin Dynasty, the Later Han Dynasty, and the Later Zhou Dynasty. The Song Dynasty that reunified China in 982 also had its capital at Kaifeng. Under Song rule, China entered a golden age of culture and prosperity, and Kaifeng became the largest city in the world . In 1127 however, the Song Dynasty succumbed to Jurchen (Jin Dynasty) invaders from the north, and in 1142 had to cede away all of northern China, including Henan. By this point, cultural and economic development in the Yangtze River delta Jiangnan region (modern southern Jiangsu, northern Zhejiang, and Shanghai) had made that area into the new economic and cultural center of China, overtaking Henan, a transition which has continued on into the modern period. Kaifeng served as the Jurchen's "southern capital" from 1157 (other sources say 1161) and was reconstructed during this time. They kept their main capital further north, until 1214, when they were forced to move the imperial court southwards to Kaifeng in order to flee from the Mongol onslaught. In 1234 they were defeated by a combination of Mongol and Song Dynasty forces. The Mongols took control, and in 1279 they conquered all of China. Mongol rule over China ended in 1368. The Ming Dynasty that followed made Henan into a full-fledged province, with borders that were extremely similar to that of the modern-day province. However, the capital city remained at Kaifeng, instead of the modern capital, Zhengzhou. The Qing Dynasty (1644-1911) did not make any significant changes to this arrangement, nor did the Republic of China in their rule over Mainland China, which lasted from 1911 to 1949. During this period, the completion of the Pinghan Railway from Beijing to Hankou made Zhengzhou, a previously unremarkable county town into a major transportation hub. In 1954, because of this transformation, the new People's Republic of China government moved the capital of Henan from Kaifeng to Zhengzhou. The PRC also established a short-lived Pingyuan Province consisting of what is now northern Henan and western Shandong, with its capital at Xinxiang. This province was abolished in 1952. In 1975, the collapse of the Banqiao Dam and other dams in southern Henan following a typhoon that caused extraordinarily high levels of rainfall is estimated to have killed 230,000 people across several counties within the province. This was the most deadly dam-related catastrophe in human history. In recent years, the prevalence of "blood selling" (blood donation with pay) among poor villagers has placed Henan in the spotlight of the nation. Many villages within the province were found to have large populations of HIV positive individuals, mostly resulting from poor sterilization techniques. The initial cover-up of the crisis by local officials, followed by national exposure, has placed Henan in a somewhat negative light. In November of 2004, martial law was declared in Zhongmou county, Henan, to quell deadly ethnic clashes between Han Chinese and the Muslim Hui Chinese. The reported number of deaths due to this clash ranged somewhere between 7 and 148, but beyond the simple numbers, the issue as a whole highlights the growing prevalence of strife between the mainstream Han people and the Muslim minorities within the province. Henan is flat in the east and mountainous in the west and extreme south. The eastern and central parts of the province form part of the North China Plain. 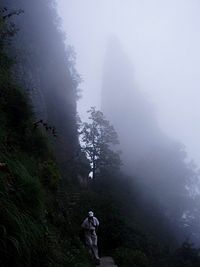 To the northwest, the Taihang Mountains intrude partially into Henan's borders, and the Qinling Mountains enter Henan from the west and stretch halfway across the province, with branches (such as the Funiu Mountains) extending northwards and southwards. 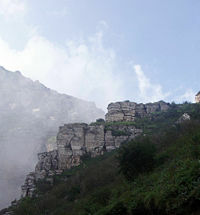 To the far south, the Dabie Mountains separate Henan from neighboring Hubei province. Four major rivers run across Henan: the Yellow River, the Huaihe River, the Weihe River and the Hanshui River, with the Huaihe River valley covering up nearly 53 percent of the entire province. The Yellow River passes through northern Henan, entering from the northwest via the Sanmenxia Reservoir. After it passes Luoyang, the Yellow River is raised via natural sedimentation and artificial construction onto a levee which is at a higher elevation than the surrounding land. From there, the Yellow River then serves as the principle division between the Haihe watershed to the north, and the Huaihe watershed to the south. The Huaihe River itself originates in southern Henan, and the southwestern corner of Henan, around Nanyang, serves as part of the drainage basin of the Hanshui River across the border in Hubei. Along with its rivers, Henan is home to many reservoirs. Some of the most important ones include the Danjiangkou Reservoir on the border with Hubei, the Sanmenxia Reservoir, the Suyahu Reservoir, the Baiguishan Reservoir, the Nanwan Reservoir, and the Banqiao Reservoir. Henan has a temperate continental climate, with most rainfall in summer. Temperatures average about 0°C in January, and 27 to 28°C in July. 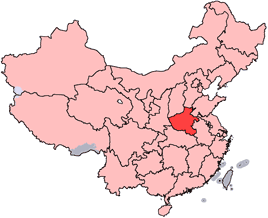 The seventeen prefecture-level divisions and one directly administered county-level city of Henan are subdivided into 159 county-level divisions (50 districts, twenty-one county-level cities, and 88 counties; Jiyuan is counted as a county-level city here). Those are in turn divided into 2440 township-level divisions (866 towns, 1234 townships, twelve ethnic townships, and 328 subdistricts). Henan is an agricultural province, leading the provinces of China in wheat and sesame production, and is third place overall in terms of total grain output. Cotton, rice, and maize are also important crops for the province. In addition to agriculture, Henan is home to several types of minerals. In fact, of the roughly 150 types of minerals in the world, 121 of them can be found in Henan. Aluminum, bauxite, gold and silver serve as the four most important mineral products in Henan, but other minerals like wolfram, cesium, coal, petroleum, natural gas, nickel, and marble also lead the nation in terms of the number of reserves. Henan is a relatively poor province. Since undergoing the economic reforms of the 1970s however, the speed of economic development has increased by an average of about 10 percent each year for the past 20 years. In 2005, Henan's nominal GDP was 1.05 trillion RMB (US$131.68 billion), a year-on-year rise of 14.1 percent. Henan's primary, secondary, and tertiary industries are worth 184.3 billion RMB (US$23 billion), 553.93 billion RMB, and 315.28 billion RMB, respectively. Its per capita GDP topped 10,000 RMB (US$1,250) . As a major coal production base of China, Henan has 65 colliery enterprises, which produce 100 million tons of coal a year, making Henan second in the country in terms of coal production. There are several important centers of coal production in Henan, including Pingdingshan, Yima, and Jiaozuo. With sizable reserves of petroleum and natural gas, Henan possesses Zhongyuan Oil Fields and Henan Oil Fields, both of which produced 5.62 million tons of crude oil and 1.495 billion cubic meters of natural gas in 2000. Henan is the fifth largest petroleum and natural gas producer in China. Due to its abundant natural energy resources, electricity generation is also another important industry of Henan. Henan is also actively trying to build an open economy in terms of foreign investment. In 2002, the total trade volume (import and export) was US$3.2 billion, including US$2.1 billion for export. Over 7,100 foreign enterprises have been approved, and foreign funds (FDI) of US$10.64 billion have been used in contracts with a realized FDI of US$5.3 billion. Foreign exchanges are increasing continuously. Friendly provincial relationships have been established with 16 states (districts) in the United States, Japan, Russia, France, Germany, and a few others. Some cities of Henan have also established friendly relationships with 32 foreign cities, by establishing them as sister cities. Member of the Jewish Zhao clan, Kaifeng, Henan, China. 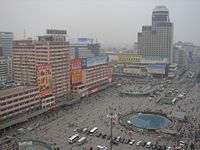 Henan is the most populous province of China, with a population of 97,170,000 according to statistics taken in 2004. If it were its own country, it would be the twelfth most populous, just behind Mexico. Roughly 98.8 percent of Henan's population is Han Chinese, while Hui account for the largest portion of the remaining 1.2 percent. In addition however, there are 51 other ethnic groups living in the province, including the Mongol, Manchu, Zhuang, Miao, Tibetan, Uyghur, Yi, Korean, Tujia, and Bai peoples. These various groups make up a very small portion of the population of Henan. Although Henan is a fairly poor province, higher education has been developing rapidly along with the growth of its economy. Elementary level education has developed steadily, and the structure of secondary education has been rearranged. According to statistics taken in 2000, there were 52 higher education institutions in the province, with 262,400 students enrolled and 20,200 teachers. There were 7,002 secondary schools with 7,195,800 students enrolled and 424,800 teachers, and 41,269 primary schools with a total of 11,306,300 students enrolled and 459,300 teachers. While these are promising figures, the overall education situation is lagging behind the national average. Educational funds per capita for primary school students ranks last in the country, and for secondary school students the total funds ranks next to last among all the provinces. While Henan's education system has improved over the years, it is clear that there is still much work left to be done, especially if it wants to compete with some of its neighboring provinces. The large population of the province also serves as a potential obstacle that needs to be overcome in this effort, as it is much more difficult to provide high levels of education to such a large number of individuals. Demonstrating Kung Fu at Daxiangguo Monastery, Kaifeng, Henan. Most of Henan speaks dialects of the Mandarin group of dialects, which are spoken in both northern and southwestern China. Linguists place these dialects into the category of "Zhongyuan Mandarin." The northwestern corner of Henan is an exception to this, as the people there tend to speak Jin dialects instead. The dialects of Henan are collectively called "the Henan dialect" in popular usage, with easily identifiable and stereotypical features. Henan opera (Yuju) is the local form of Chinese opera, and it is also famous and popular across the rest of China. Henan Quju and Henan Yuediao are other important local opera forms. Henan cuisine is also well-known, with traditions such as the Luoyang Shuixi (Luoyang "Water Table," (consisting entirely of various soups and broths), Xinyang Duncai (Xinyang brewed vegetables), and the traditional cuisine of Kaifeng. Important traditional art and craft products include: Junci, a type of porcelain originating in Yuzhou, which is noted for its unpredictable color patterns, the jade carvings of Zhenping, and Luoyang's Tangsancai ("Tang Three Colours"), which are earthenware figurines made in the traditional style of the Tang Dynasty. Interestingly, three of ancient China’s four great inventions, the magnetic compass, paper, and gunpowder, were all originally invented in Henan. 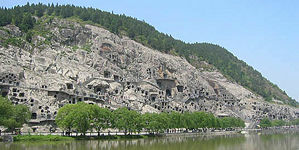 Longmen Grottoes (Mount Longmen), Luoyang, Henan. Henan is located in the Yellow River valley, in a place where the people of ancient China grew and developed. This has allowed it to become one of the most important cultural areas in all of China, and has provided it with a sizable number of tourist sites. Three of the Seven Ancient Capitals of China are located in Henan, including: Luoyang, Kaifeng and Anyang. In addition to this, the remains of some of the earliest human settlements have been unearthed here, including the over 7000-year-old Peiligang Culture Site, the 6000-year-old Yangshao Culture Remains, and the 5000-year-old Dahe Culture Remains. Due to its long and storied history, Henan is one of the provinces which has the most historical artifacts and relics in the entire country. There are 16 national and 267 provincial protection units for historical relics, and the Henan museum houses 120,000 historical relics, including over 40,000 rare ones. The Longmen Grottoes, located near the city of Luoyang, was named a UNESCO World Heritage Site in 2000, and is famous for its majestic beauty and large collection of Chinese Buddhist sculptures and statues. Luoyang is well known as the home of the White Horse Temple. Kaifeng, one of the ancient capitals of Henan, also contains many outstanding tourist sites, including the Iron Pagoda (Tie Ta) of the Northern Song Dynasty, the Dragon Pavilion (Long Ting), (the site of the imperial palace of the Song and Jin dynasties), and the 1,400-year-old Xiangguo Temple, which is one of the most famous Buddhist temples in all of China. Two important railway arteries, the Jingguang Railway (which connects Beijing to Guangzhou) and the Longhai Railway (which connects Lianyungang to Lanzhou), pass through Henan and cross at Zhengzhou, the provincial capital. The Jingjiu Railway (connecting Beijingto Kowloon) also passes through Henan. With the recent completion of the Zhengzhou to Xinxiang expressway, a continuous highway now crosses Henan from north to south, as part of a longer line linking Beijing with Shenzhen. Another expressway crosses Henan from east to west, and more are being built as the province continues to grow. Xinzheng Airport in the capital city of Zhengzhou is the province's main airport, with a designed annual handling capacity of six million passengers and 30,000 tons of freight. This makes it one of the ten largest airports in China, and one which also serves in an important role as an alternate hub for Beijing's international airport. This page was last modified on 14 December 2017, at 15:58.